Provides mid medial and lateral support to improve stability, helps reduce injury and during recovery. No transfers, each arm splint is independently anchored in padded envelopes. Wider side fins to maintain strength. Cable ties for individual tightening. Neoprene (latex) provides thermal compression. 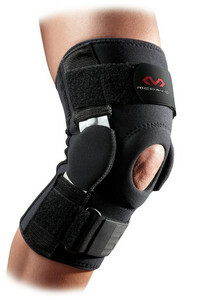 Padded hole 360 ° insulates and supports the patella. Perforated rear side provides heat and moisture management. All for a comfortable fit. In addition, it is about 5 mm thick neoprene sleeve on both sides of the nylon coating for durability. Wash by hand in warm water with mild detergent, rinse thoroughly and allow to drip dry. Do not machine wash. Do not put your dryer or chemically cleaned. Although the brace can be used to protect the knee, but no brace can prevent any possible injury to the knee, and therefore does not provide any warranty, expressed or implied, that the medical device to prevent such injuries.